Delivering a great product presented in a professional and distinctive package is the foundation that attracts customers, builds trust and turns them into clients. Your product is great customer service and client communication. The packaging starts with your website and extends through to listing marketing pieces such as feature sheets, postcards and online photo slideshows and Single Property websites. These are the finishing touches that set you apart from your competition. Whether you're looking for a team website to feature all your team members and their listings, or a CRM shared with your partner, Jumptools has you covered. For more information or to have us help you get set up on a trial subscription, give us a call at 416.645.0636 or drop us a line at sales@jumptools.com. Company or office websites, plus bulk licensing that makes it affordable to provide a basic CRM for all your salespeople. 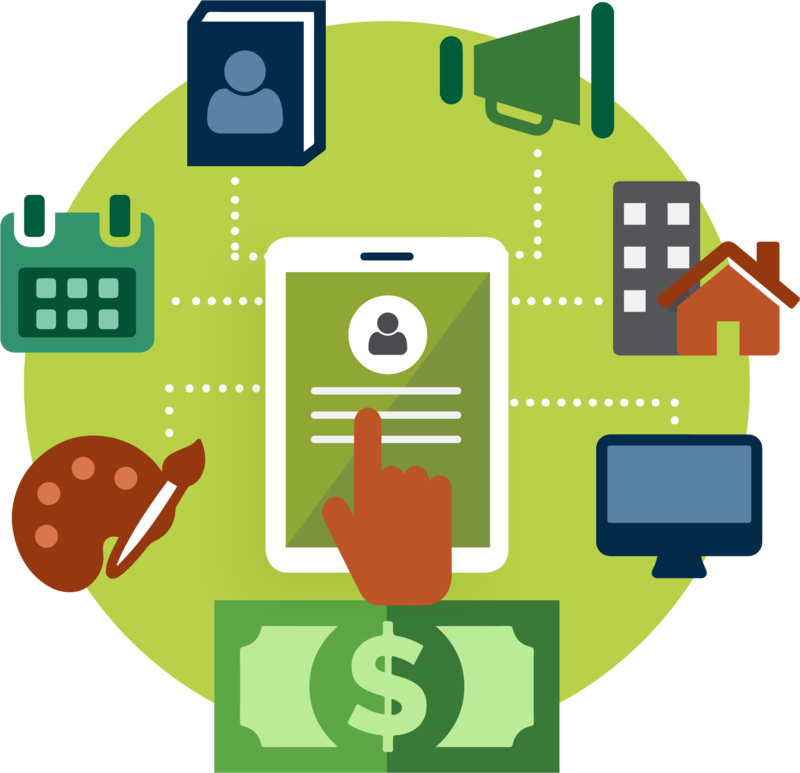 Ask us about personalizing our tools with your brand for your agents. Connect by email at sales@jumptools.com or call 416.645.0636. Let Jumptools make you look great. Everything a Real Estate professional needs to look their best in print and online to generate interest and leads. High impact agent websites get your message out and communicate your professionalism to potential home buyer and sellers. Open house feature sheets, postcard and online listing slideshows and Single Property websites set you apart from your competitors when it comes to marketing listings. All the tools you need to nurture and strengthen your customer relationships, in one convenient package. Focus your time on what you do best, and watch technology do the rest! Never forget a repeatable task again. Automate newsletters, referral thank yous and leave-behind reminders. 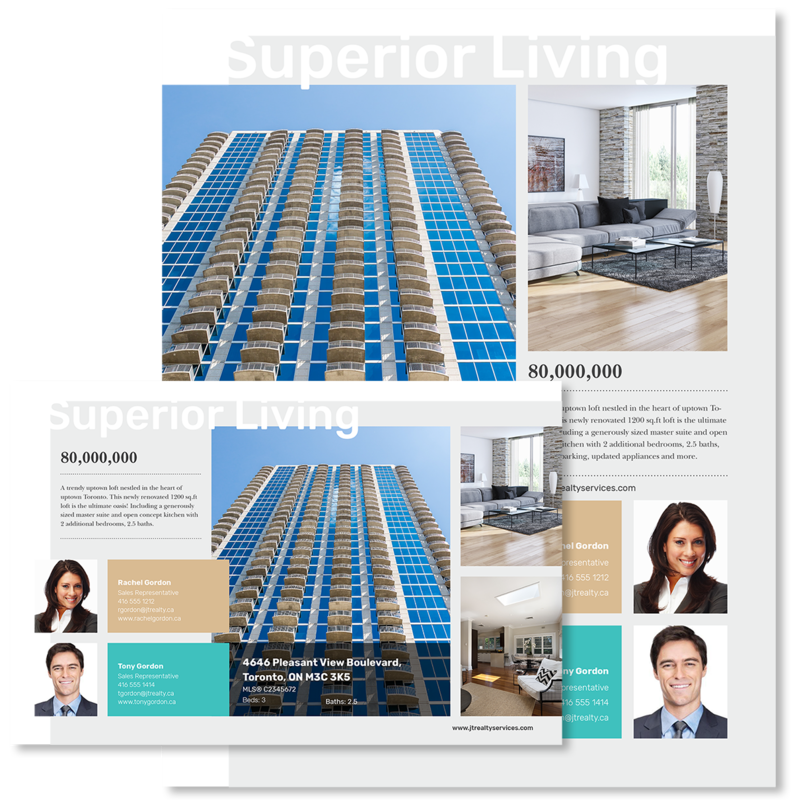 Market your listings with customized feature sheets, and just listed or sold over asking postcards. Our easy-to-master templates save you time and money. More and more people are finding their dream home and real estate agent online. Our intuitive site builder helps you create a website that can get you and your listings noticed. Email continues to be one of the most cost effective ways to stay top of mind. There's so much you can achieve by marketing to your entire contact list with just the touch of a button. Whether you call it My Book, customer database or CRM, you’re talking about servicing customers, past, present and future. Use our CRM, it’s your blueprint to success. We help you create an organizational system that works for you. Our Action Plans help you establish consistent and best practice routines for repeatable success. Book appointments, set blog publishing reminders, schedule phone calls and follow ups, and never forget a client’s birthday. Easily create great-looking single property websites to create maximum online exposure for your sellers. You're constantly on the go. Take your CRM with you so you can update contacts, capture new referral leads and stay on top of your appointments and to-do list on the road. communications appropriate to the different types of people in your book. producers do and watch your business grow. Earning trust starts immediately from your open house feature sheet to your social sharing. Even when you’re not working the room, make sure you’re always making the right statement. Great marketing makes the ‘sale of product’ easy … and sometimes unnecessary. It took me 30 minutes to have my website up and running. I particularly liked that all my listings were uploaded automatically which saved me a great deal of time!